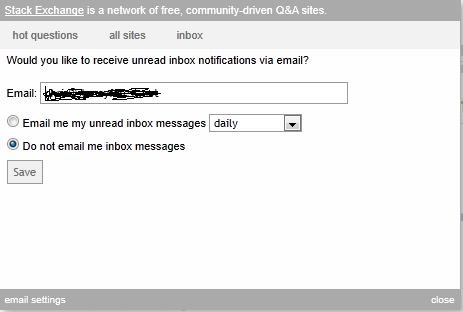 Very confused whether that sends me emails every three hours (as per the drop down) or not at all (as per the checkbox). I'm unable to uncheck the box. What browser is that rendering in? Chrome's rendering still makes it clear that the drop down only applies when the top button is selected - but that won't help you with no top button at all. Works OK in Safari (5.0.6) -- Smells like a browser bug Rob. Not the answer you're looking for? Browse other questions tagged bug status-completed site-usage . 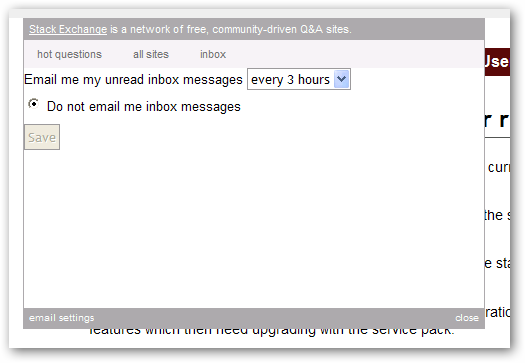 Is it possible to merge the emailserver and email-server tags?